The first six years of a human being’s life are critical in the formation of the member of society they will become. There are periods of sensitivity each child passes through during these first six years of life. Periods of sensitivity are optimal times for absorbing from the sensory input a child is exposed to the stuff they will create themselves from. The child is shaped through the beauty, order, and content of the environment. The environment must be safe, warm, attractive, and orderly. The environment must be peaceful and child-centered. The furnishings must be light enough for the child to move comfortably yet durable. The environment outside as well as inside is critical to the development of the child. There must be space to run, things to climb on, places to dig and gardens to watching things grow. You may take work out after you have had a demonstration. You must respect another child’s work and not interfere with or disrupt someone’s work. You must use the materials with care and purpose. The facilitator between the environment and the child. The one who sets the tone for the classroom. A person who loves and nurture the spirit of the child. The implementer of the class rules, and the protector of all the children. A guide, friend and partner in discovery, observer, and maintainer of the environment. Children are born with a unique “bent”. It is not our job to recreate the child but to assist each one in the process of learning who they are and what they were created to become. Each child has a particular learning style. It is our work to observe carefully to determine what that learning style is and make instruction compatible with that style. Children have a need for order. Each human being on the face of the earth is worthy of respect. The “normalized” child has a love of learning. Exposing young children to music, art, design, literature and poetry, geography and diverse cultures can make an understanding and desire for these aspects of human culture as natural as breathing in and out. Cooperation and collaboration is fostered rather than competition. Work has its own reward for the young child. Freedom is possible when we learn to take responsibility for our actions. Children are process oriented, not product driven. Children want to be able to do “things” for themselves. Doing meaningful work is important to the young child. Their play is thier work. Fostering parent education/understanding of the process their children are going through. Fostering respect for our planet: the water, the air, the plants, the birds, and all living creatures, especially for mankind. Fostering and modeling problem solving skills in our students by giving them opportunities to resolve conflicts peacefully. Partnering with parents in aiding their children to be independent, to do it themselves, so they may master inter-dependence later. 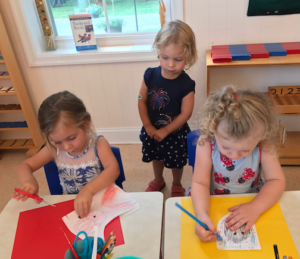 Partnering with parents in exercises of courtesy and graciousness, character qualities that foster peaceful relationships in all areas of our life. 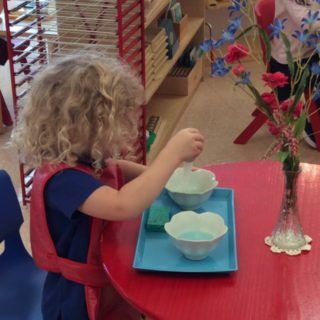 Montessori is not just “material” presented by a teacher in a unique environment. Montessori is an attitude in the heart of adults toward the process of childhood, which assists children in becoming themselves.